If you love a pun then this is the place for you! But as you’ll see, the puns are just the cherry on top and this unique venue is awesome fun for the whole family! There used to be a medical centre at the top of the Piazza at Castle Towers. The new Holey Moley Golf Club and Strike Bowling venue has since moved in and it’s about as far from a medical centre as you can get! This type of venue is new to the Hills and we have a feeling it’s going to be hugely popular, as there’s something for everyone. 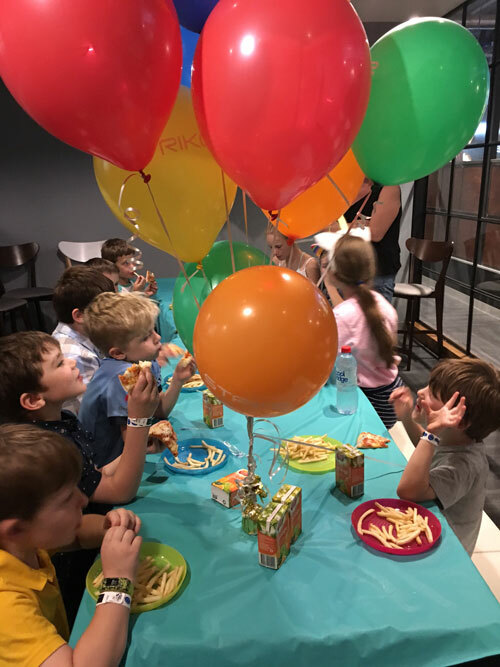 We can picture epic kids’ parties (obviously), a super fun date night if you’re looking for something way more quirky than a standard sit-down dinner, an awesome corporate event venue, a hen’s night, a fun catch up with girlfriends, a night out with the guys or a family day out. Now that we see it, we can’t believe it hasn’t happened before – it’s a match made in heaven! 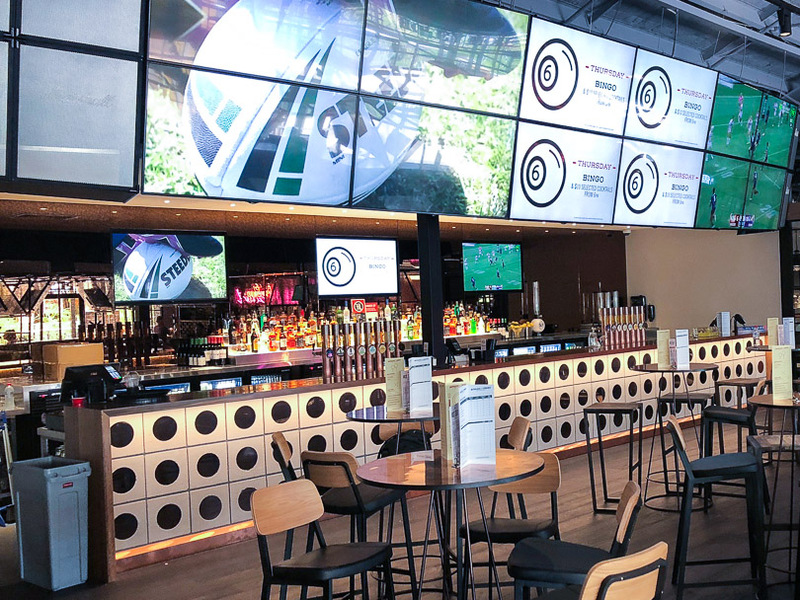 It’s the one venue but it’s divided into the bowling lanes on your left and the putt putt course on your right, with a bar and seating in the middle. They feel both separate yet combined which is actually very clever and we can easily see how you can meld both into a kid’s party for example. There are 10 bowling lanes, with two of them being separate from the main lanes. This would be good for a party with smaller kids, where you want to keep a closer eye on them, away from the main bowling area. 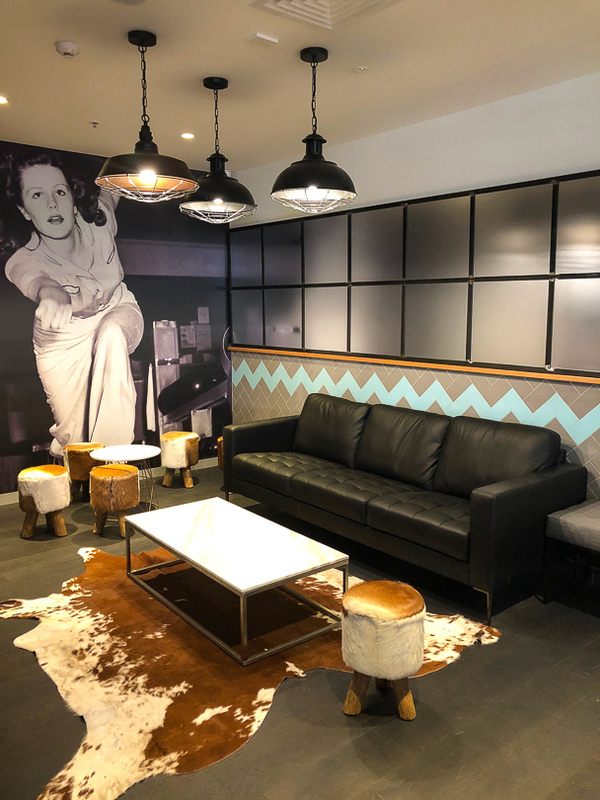 The bowling lanes have comfy and on trend lounge areas. Then you come to the Box Seat Bar and seating area. 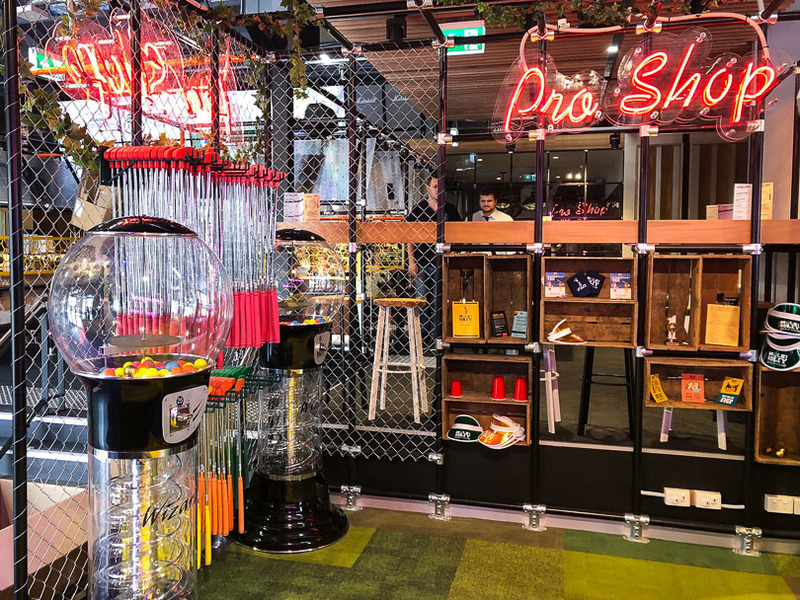 If you need a breather in between bowling, playing golf or belting out a tune you can recover with all the culinary delights you’d expect when mini-golfing and bowling – fries, burgers, pizzas and hot dogs washed down with soft drink, beer and cocktails. Perfection. There will be daily deals too such as the ‘Cluck Yeah’ on Wednesdays – $1 wings and $5 bubbles all day, Bingo on Thursdays and the ‘Family Feast’ on Sundays – $37 for 2 fries, 2 pizzas and a jug of soft drink. Moving along from the bar we come to the karaoke rooms and then the escape room. This is all a bit hush hush but we push for a little more detail and it sounds very cool indeed. Think lab coats, important briefings, top secret stuff and a mission to solve. 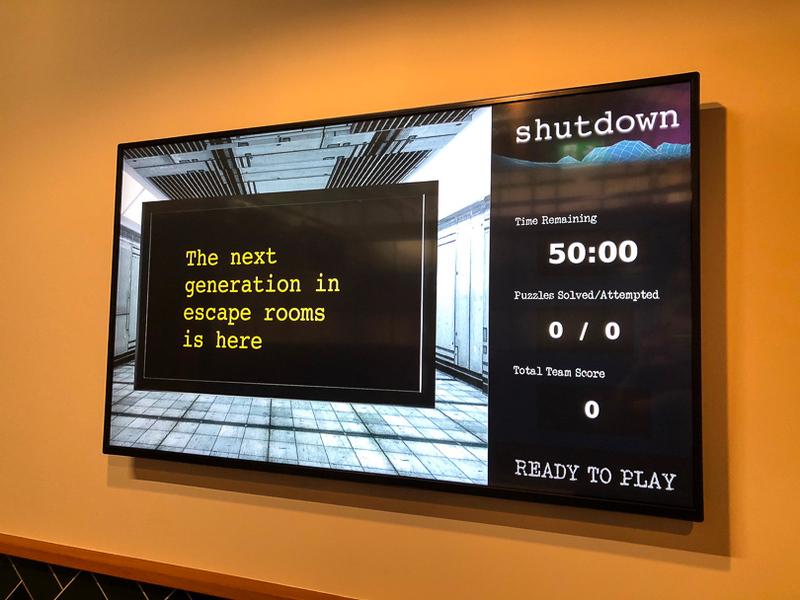 If you’re considering the escape room to include in a kids’ party package, you’ll need to think about the ages of the children and type of things they like. Some kids would be freaked out by this and others would love it. We estimate kids about 8 or 9 years and above would probably think it’s pretty awesome. 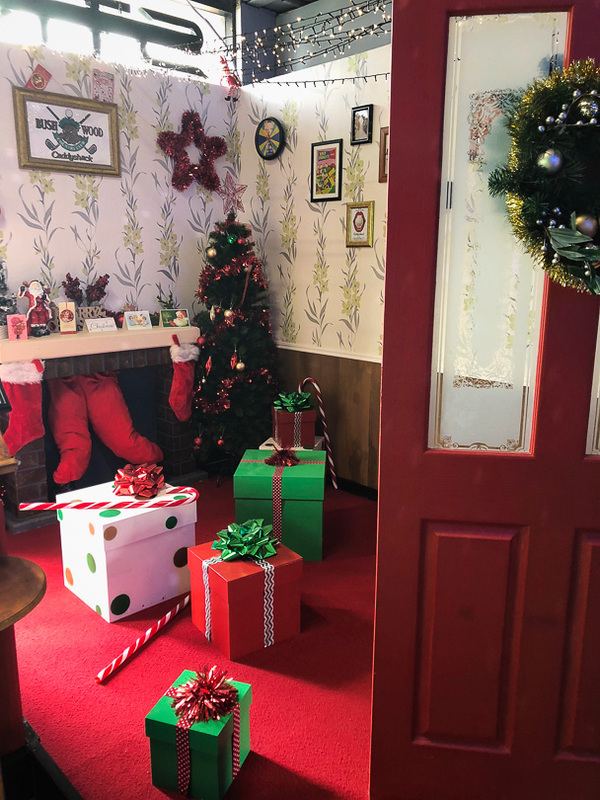 After you’ve managed to escape it’s then onto the designated party rooms when you’re ready for some party food and cake. These stylish rooms have lots of windows and light which we like, as sometimes those party rooms can be a tad suffocating! If you were to host a kid’s party here, there’s a tonne of flexibility based on the age of the kids and what they’re most keen to do. They may want to predominantly focus on the golf and only spend a short time bowling or vice versa. Anything goes which is great. The putt putt course is on the right hand side of the venue.There’s a front 9 and a back 9 and it’s flexible as to whether you play 9 or 18 holes. If you’re teeing off for the full 18 (or going really hard and playing 27), you’ll be pleased to know that you can stop half way at the retro caravan for a rest and a refreshing beverage! But let’s go back to the puns for a bit can we? Not only are there puns, they’re old school puns at that! 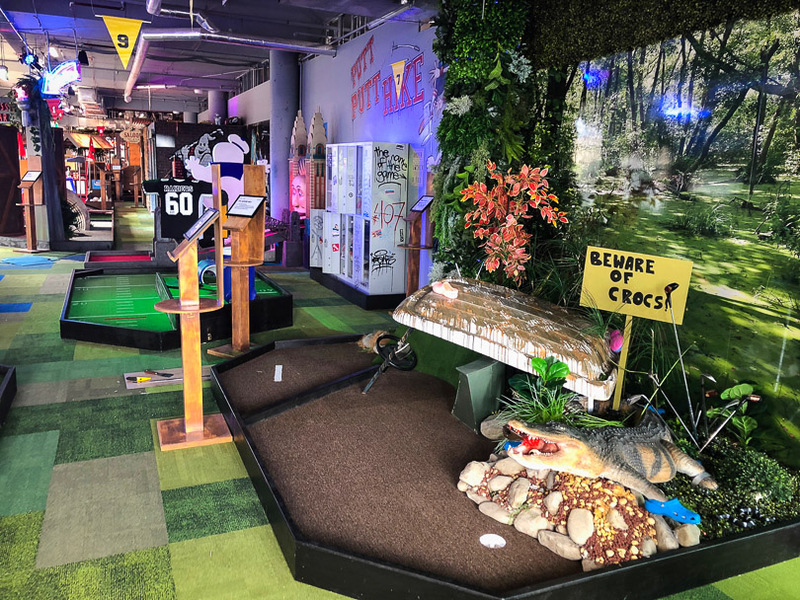 Here’s a teaser of some of the holes on the golf course: Jurassic Par (dinosaur themed, der), Children of the Pawn (chess themed), Extra Teerestrial Activity, Shut ya Trap (Mouse Trap themed! It’s too much to bare!) and O Christmas Tee (yes, all year round), just to name a few. 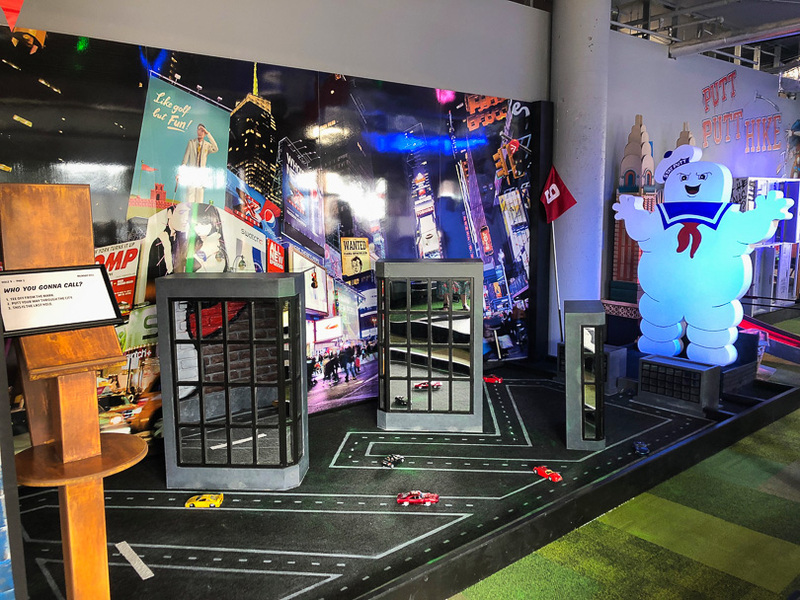 While kids will love the course, there’s stacks of grown up references and things that adults will appreciate – kind of like the jokes in kids movies that go WAY over their heads! We’re pleased to see that the puns spill over into the food and drinks menus too! Think the Cluck Norris burger, the Chikira, and the Cheese and Thank You pizza. And on the cocktail front there’s the Pulp Siption, the Berry Maguire and the Bull Gates. Stop! 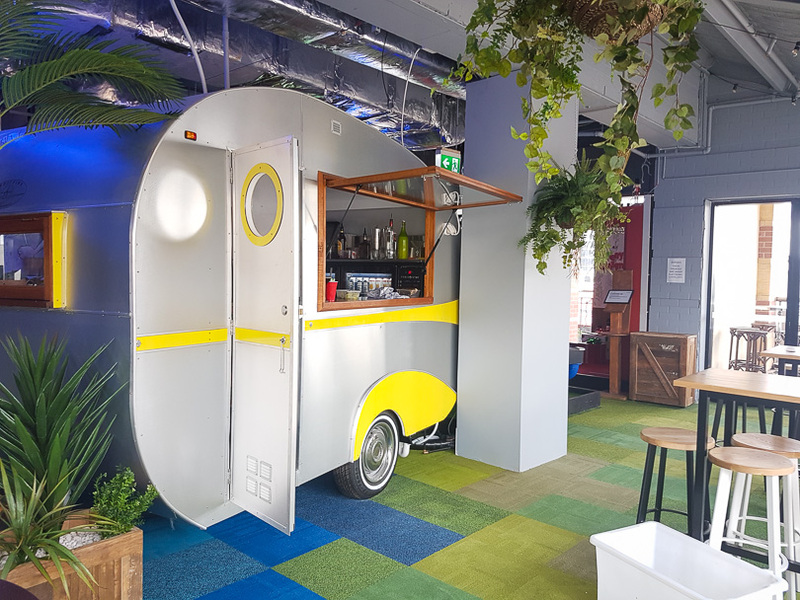 It’s all these things that indicate this place doesn’t take itself too seriously – the main aim is just to have a really great time and we think you’d be hard pressed not to. We love their helpful suggestions on the score card you receive too, such as ‘Don’t swing too hard. Don’t smash stuff. Don’t punch your friends. Just be nice and we’ll all have a lovely time.’ Indeed. The Piazza (upstairs), Castle Towers. 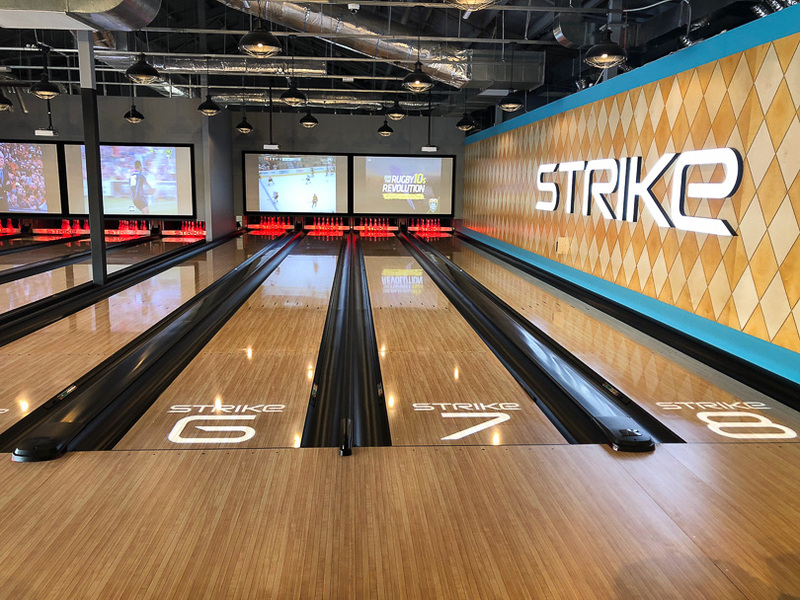 Note – you can book parties through both Holey Moley Golf Club and Strike Bowling.